Are you a veteran looking to move into a new career? RTN, Register Tape Network actively hires military veterans who are proven leaders, team members, and incredibly hard workers. 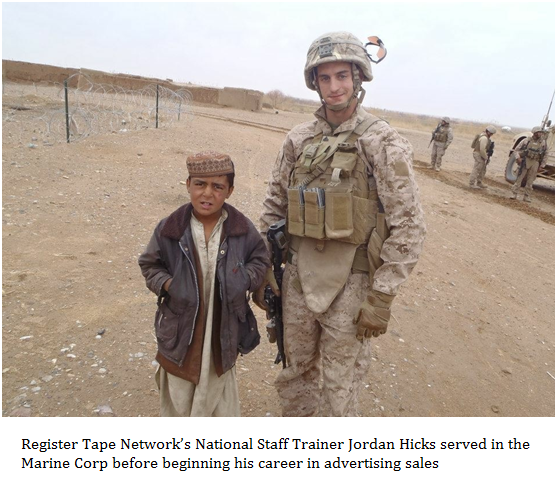 Jordan Hicks, a former Marine Corps sergeant and RTN’s national staff trainer, said his military service prepared him for a career in sales. After returning from Afghanistan, Jordan believed his only career options were in law enforcement, so he became a campus police officer. Jordan saw an advertisement and applied for a career as an RTN sales representative. At the time, his aim was to make enough money to support his wife’s goal of going to nursing school. “I ended up getting promoted, and now I am a national trainer and get to do what I really want to do,” he said. Only a few years later, Jordan’s wife completed her degree and began her nursing career. He said that being part of the RTN sales team made his transition from the military much easier. An RTN sales career is for anyone who communicates well, can lead, and confidently stand before people and talk—skills developed in the military. Like the military, RTN marketing sales representatives are trained through a structured system. “With our system, it doesn’t matter how much experience they have—they can sell, and they have a veteran teaching them how to sell,” he said.